LONDON (AP) — Former Beatle Paul McCartney has told a British newspaper he believes he once saw God during a psychedelic trip. 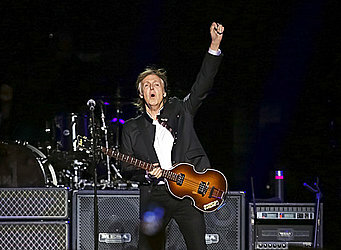 The 76-year-old star told The Sunday Times he was "humbled" by the experience. He said that "it was huge. A massive wall that I couldn't see the top of, and I was at the bottom. And anybody else would say it's just the drug, the hallucination, but we felt we had seen a higher thing." The Beatles' music was heavily influenced by psychedelic drugs in the band's final years. McCartney also spoke of allowing himself to believe that his lost loved ones, including his late wife Linda, are "looking down" on him. The singer is promoting a new album and a tour. He remains one of music's most popular concert acts.